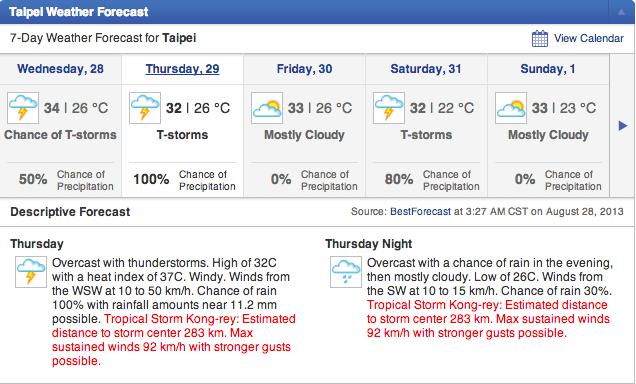 Typhoon Season is certainly upon Taiwan. They also call this season “summer”; fortunately, all of the typhoons to come through Taiwan so far have been nothing more than a downpour that lasts all day. Last time the river behind the apartment I’ve been staying at didn’t even flood. So, what is it this time? If you check out the screenshot below, you’ll see that the typhoon is coming from a completely different direction than the last one. Instead of a storm moving due east, this one will be heading north along the coastline and bringing with it lots and lots of rain and wind. Interestingly, this storm was originally supposed to head much further east and not present any problems for Taiwan at all. Over time, it’s clear that it’s moved further and further west. At the moment, it seems like we’ll be in store for about a day of rain and wind, but nothing close to as rainy or windy as the last storm that came through. Oh, and you are reading that correctly. 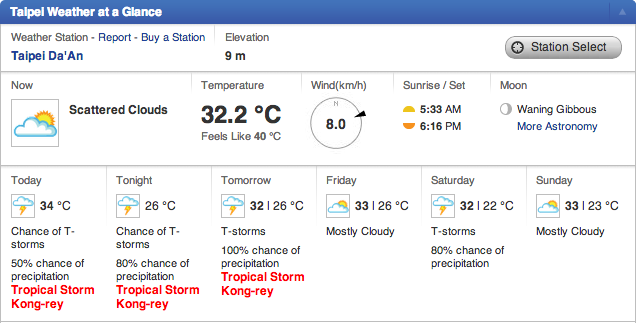 This is tropical storm “Kong” …or “Kong-rey”…although I have no idea what the “rey” is supposed to signify. You can see below in the description of the anticipated weather – the expected rain total is just over 11mm…which is less than half an inch. I don’t quite understand how these typhoons work, but half an inch of rain and some wind seems like what you would expect from an afternoon at an amusement park in the middle of August. That big red blob (above) is only going to drop half an inch of rain? Something seems wrong with this picture. Only time will tell. All I know is that if the storm changes paths again and we get some flooding – I’ll be right out there with my camera looking to find pictures of people trying to ride their motorbikes through flooded streets. 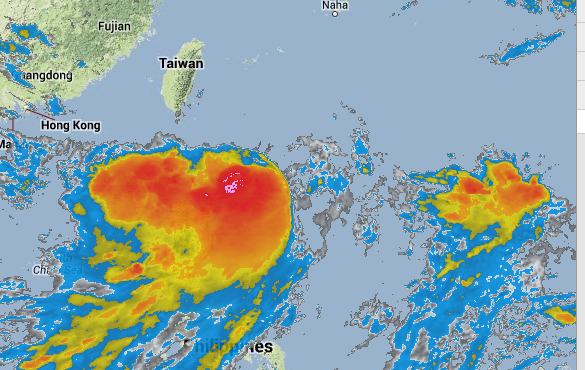 This entry was posted in Taiwan and tagged Radar and Maps, rain, Taipei, Taiwan, Typhoon Kong. Bookmark the permalink. I will just call you Phillip Jones from the old days…….